Using efu lists and uncheck "remove offline indexes": do not show duplicate entries? If I use efu lists and uncheck "remove offline indexes" Everything partially shows duplicate entries. Is there a way to make Everything not to show such double entries although using both the efu lists and that option unchecked? Re: Using efu lists and uncheck "remove offline indexes": do not show duplicate entries? Currently, there's not an option to do this automatically. Set the search to: !filelistfilename:. Now when the "No file lists" filter is active, no file list results are shown. When the Everything filter is active, all results are shown. If you have multiple file lists, with some offline and some online this doesn't really work. 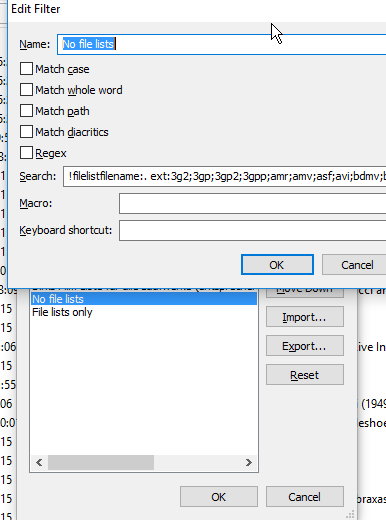 Set the search to: filelistfilename:. Yes, both filters are really great. A bit enconvenient, but with two shortcuts for both of the filters I could switch between them and see the different results quite fast. to the "Search" field to filter video files? So I would have to re-create all of the flters with and without showing the file list?